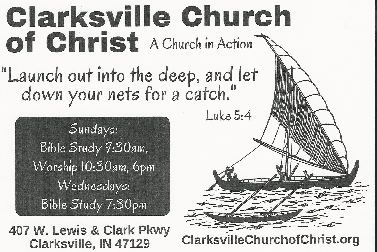 Welcome to the website of the members of the Clarksville Church of Christ. We are a group of christians committed to reproducing first century christianity in the 21st century! We invite your participation as we focus on implementing our theme for 2019, "Launching Out Into the Deep", based on Luke 5:1-11. The the adult class, under the direction of Stephen Nale, is currently engaged in a study of Bible Basics essential to new converts AND growing Christians. We invite you to come and participate in this class. Study booklets are provided. The class will meet during regular bible study periods on Sunday mornings at 9:30 and Wednesday evenings at 7:30. Please come join us! Ever thought about reading the entire Bible from Genesis through Revelation over the course of the year? Copies of the 5 Day Bible Reading Plan are now available in the foyer for our members and guests. This easy to follow guide allows you to read the enire Bible in a year, reading 5 days/week. Perhaps you only want to read the New Testament? No problem: the guide provides a schedule for that reading as well.